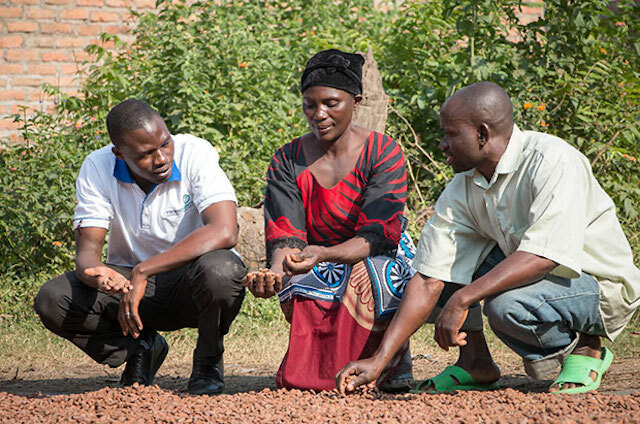 Launched in 2009 with support from Irish Aid, TechnoServe’s Cocoa Quality and Market Access (CQMA) program is improving the livelihoods of Tanzanian cocoa farmers by helping them increase yields and quality. The program is providing training in good agricultural practices, post-harvest handling techniques, financial literacy and gender modules. CQMA is also working to build the capacity of farmer business groups and facilitate market linkages. Men were not adequately sharing information from the trainings with their wives. Women face barriers to group entry, despite it being advantageous for them to join. Over half of women who did not join a farmer group reported that their husbands had made it explicitly or implicitly clear that it was their role. Women, especially those who were married, were less likely than men to speak up on issues that are important to them. Social norms in the region strongly favor the inheritance of land by men; only 42 percent of households report their cocoa farm is jointly owned and even less – 5 percent – report being female owned. However, even in households where only their husbands own the cocoa trees, 80 percent of women contributed their labor. Women lack control and knowledge regarding cocoa income in the household. On average, women reported that they directly controlled 39 percent of the income compared to just 10 percent for jointly-owned farms and 4 percent for husband-owned farms. Even in households with woman-owned or jointly-owned cocoa farms, about a third of women could not report the household’s cocoa income. Attitudes towards female leadership in farmer groups can be negative, with 16 percent of groups reporting that they didn’t encourage or support women becoming leaders or members. There was an extremely high correlation between invitation to training and actual training attendance. Nearly all men – 96 percent – and most of the women said they believed it was beneficial for both husbands and wives to be group members, citing increased income, better decision-making and increased cooperation in the home as potential benefits. Women in families with jointly owned farms were more likely to feel the impact of changes in personal income than women in households where the cocoa farm is perceived as owned by the husband – regardless of whether they worked on the husbands’ farms or not, making jointly owned farms a good base to drive female engagement. Women reported more benefits than their husbands when they were both members of the farmer group, with increased income showing the greatest differential. Encouraging joint membership is a promising practice for closing the gender gap within the household. Groups with a great number of women in leadership positions had greater female membership on average, with groups having at least 50 percent female leadership have at least 25 percent women members. Encouraging more female leadership created the potential to engage more women in group membership. Groups with a stated gender objective were more likely, on average, to have greater women membership. Proactively reaching out to women, through both direct invitations to trainings and encouraging their husbands and other community leaders to also invite the women, increasing female participation in trainings. Increasing communication about the importance and potential benefits of having both husbands and wives in the household attend program trainings and meetings. Encouraging leaders to spend more time understanding why couples become members and then use this learning to encourage both husbands and wives to join. Publicly acknowledging those households who do have both husbands and wives attending and groups with high female membership, using them as role models for others. Awards can also be a powerful way to reward “positive deviants” and motivate others. Working with groups to increase women’s participation in key positions, such as advisors, committee members and leadership positions within farmer business groups in order to leverage female leadership to increase women’s participation. Encourage men to more equally share income-related decision-making with their wives. 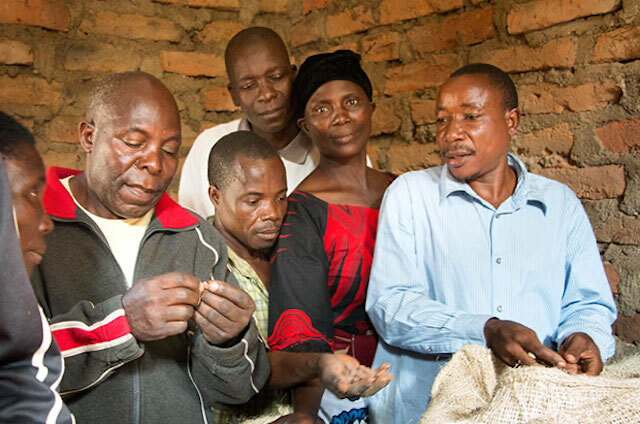 In particular, financial literacy and agronomy trainings that include both husbands and wives help reduce the gap in income control by providing shared knowledge and understanding what makes joint decision-making possible. Understanding barriers to women’s attendance and encouraging groups to set the time and place of the meeting so the maximum number of women can attend, giving advance notice so they are able to balance their domestic responsibilities and training. Build women’s confidence and ability to speak up on issues during trainings and encourage farmer groups to “make space” for women’s voices in meetings. Aiding farmer groups without a constitution to draft one that integrates gender objectives and developing a gender policy for those groups with a constitution in place. By addressing gender equity, the program saw several positive results. Over 60 percent of farmers in households headed by men and 48 percent in women-headed households reported an increase in their cocoa income versus last year. Both husbands and wives in married households report that joint discussion in relation to the use of cocoa income has increased. The increase in communication is greater for those households in which both husbands and wives attend the training, compared to those households where only one of them attended. By conducting a detailed gender analysis and integrating gender into project design and implementation, CQMA is positioning beneficiaries to reap long-term sustainable benefits. In Tanzanian cocoa-farming communities, both farm ownership and cocoa income belong predominantly to men. Men dominate decision-making, often spending the earned cocoa income without consulting their wives, despite the contribution they make to farming. In order to create balance in cocoa ownership between men and women, CQMA facilitators have deployed a variety of approaches to encourage women’s participation in trainings, including requiring each farmer business group (FBG) to elect a woman for at least one of its three leadership positions: chairperson, secretary or treasurer. 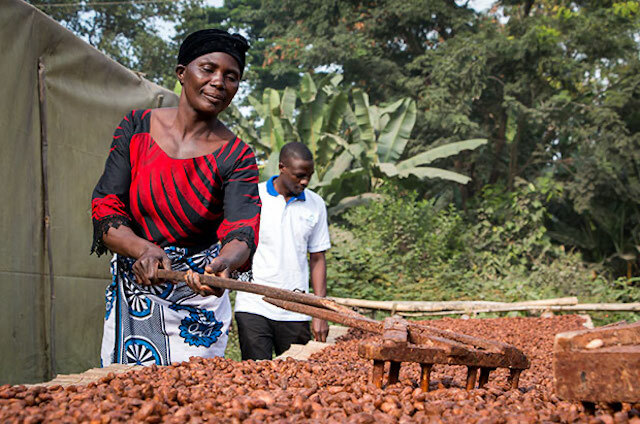 These changes have helped women like Mizinala Shadrick Lutolo act as leaders in the cocoa value chain. Mizinala lives in Mababu, a village in Kyela District in southern Tanzania, with her husband, Livingstone, and their four children. She splits her time between the production of cocoa and other agricultural crops, tending to livestock and domestic chores. Five years ago, Mizinala and her husband joined other cocoa farmers in their community to form the Mababu Farmer Business Group with support from CQMA. 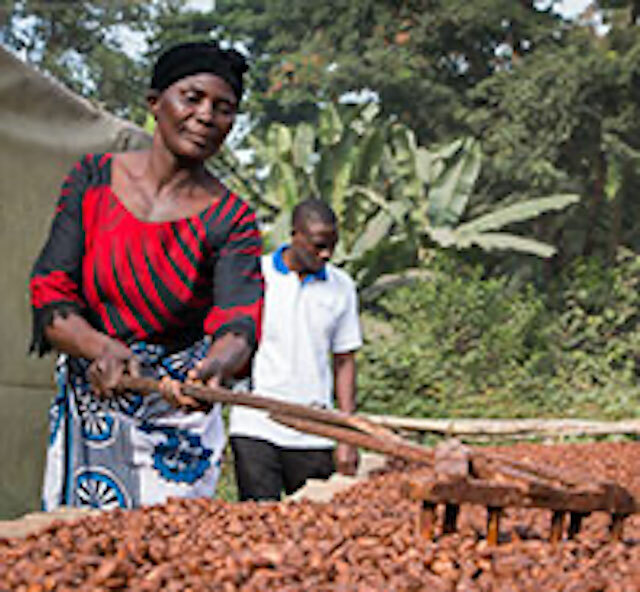 In 2012, at the urging of a U.S.-based cocoa buyer, and with training on good governance from TechnoServe, the group successfully nominated its first female chairperson. When it came time for a new election last year, Mizinala decided to run, gaining encouragement from her husband, who told her “I believe you are the best woman that can lead our group.” Mizinala became the Mababu FBG’s second female chairperson. Despite the heavy workload of her farming and household responsibilities, Mizinala devotes herself fully to the role of chairperson, listening to and engaging with fellow group members. “As the chairperson, I work hard to unite the group’s members and open room for new farmers to join and create an environment where everyone’s opinion can be shared and respected,” she said. Constructing new solar dryers for fermentation, and beginning construction on a new FBG office, without TechnoServe’s financial support. Mizinala was also able to increase the cocoa production on her own plot, harvesting 415 kilograms of cocoa in 2015 compared to 380 kilograms in 2014. Her cocoa sold at premium rates, generating nearly $900 in revenue. Meanwhile, the family farm has fared well with a 24 percent increase of cocoa harvested in 2015. Mizinala credits these successes to CQMA’s training on good agricultural practices, her family’s equitable participation in cocoa activities, and her improved business skills since becoming the FBG Chairperson. Mizinala is even seeing improvements in how she and her husband work together. They now make joint decisions about how to allocate their income from cocoa. The couple has built two new homes and sent two of their children to private education institutions. “My sons are happy with the better education received, and my family is so happy because we see the benefits our hard work produces,” said Mizinala.